Riviera Finance will be at The Great American Trucking Show on August 23 – 25 in Dallas, Texas at Booth 2310. This is an exciting annual event that you won’t want to miss if you’re involved in the trucking industry in any way. The GATS features more than 500 exhibitors who represent areas such as truck, engine, trailer, parts manufacturers and much more. The GATS is a lively, social and interactive occasion where you’re sure to meet many friends old and new and learn a great deal about the future of the industry. Here are some of the activities that you’ll find here. These are just some of the fun and informative activities you’ll find at this year’s GATS. Another good reason to attend is to stop by the Riviera Finance booth #2310 and meet with the company that pioneered the freight bill factoring industry and continues to lead the industry in service and innovation. All businesses are concerned with maintaining healthy cash flow. To a great extent, your cash flow depends on customers promptly paying their invoices. If you’re a company that ships products, you have to wait for shippers and brokers to pay freight bills. The weeks or months that customers typically take to pay bills leaves a gap in your cash flow. Freight bill factoring is a simple, fast financing solution that helps you solve the cash flow problem. Paid Within 24 Hours. You can get cash within 24 hours. So you can pay suppliers on time, make payroll, and move onto the next load. Haul more loads and increase your revenue. Having cash available now allows you to cover the expenses associated with taking on additional business. Complete collection service. Never worry about getting paid. The Factor will be your back office and deal with credit approval and collections. Fuel Cards. Receive fuel discounts at gas stations. These are some of the reasons you may want to consider factoring for truckers and freight companies. Riviera Finance, a leader in the field of invoice factoring, has been in business for almost 50 years and has 25 locations in the United States and Canada. Freight bill factoring for truckers and freight companies is a simple way to improve your financial situation. 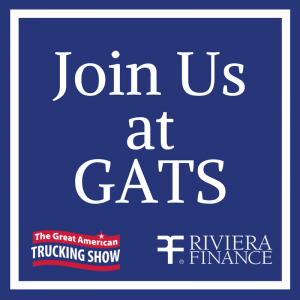 To find out more about freight bill factoring, meet us at The Great American Trucking Show or contact Riviera Finance today!